I got up this morning when my dog reminded me it was time to take her out for her morning routine. Then after looking after her I turned on the power to my new raceway and drove one of my Carrera GT3 cars for about 20 laps on each of the four lanes. Later, after breakfast, I'll go back out and repeat the process. I am determined to keep all four lanes in good working order on a daily basis so that when a friend or two drops by the track will be ready for action. Previously, at the old location, I would get there on my once or twice a week visit and spend the good part of an hour just getting the two middle lanes running. It was a real p.i.t.a. because of the dust levels and lack of continuous use. And hey, if no one drops by it's their loss, not mine. Up to now I have never charged or asked for money and I'm thinking that may be part of the problem. People tend to equate the value of something with what it costs. If something is totally free then it is either worthless or there is a catch somewhere. So, I am thinking of asking for $5 a visit or a $20 annual membership. If you are not satisfied I will return the money. I'm also thinking of starting a pool where everyone interested chips in $5 and after three months the person who has recorded the fastest lap, either in a race or just time trials takes the cash (I will not be allowed to participate). I will get a white board and keep everyone's best time recorded. Each winner will have to sit out the next pool. Maybe the lure of easy money will stir some interest. I'll be there to sign up for your annual membership, Bob. I can't make it down too often but you always provide the best in entertainment. Debary Glenn looks great ! Now about the fastest lap .. any particular type or class of car? Money can certainly change peoples perspective on things...."think carefully," would be my advice. That's really all I intend to do. Now that the track is at home and I have no extra expenses to pay an occasional visitor is all I need to be happy. Last night my friend Garold came over, but this time not to work on the track, but instead to have some fun running cars on it. 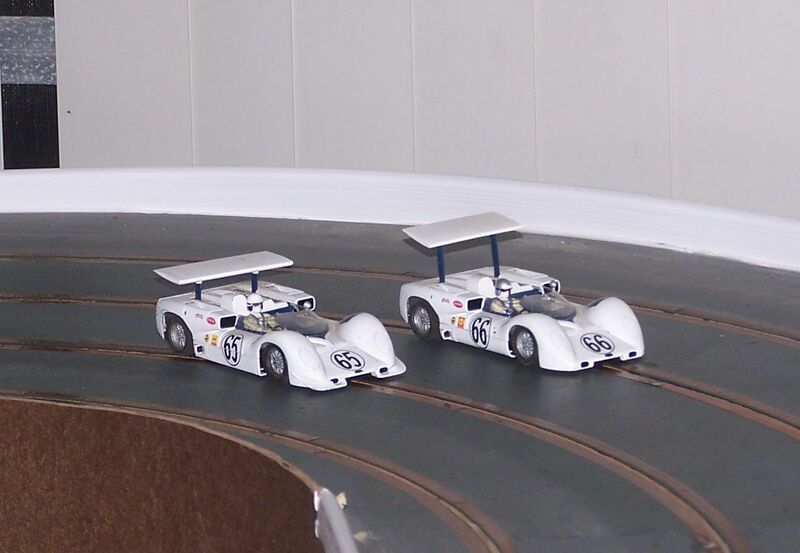 He is primarily into classic 1/24th scale cars but I am slowly winning a convert to 1/32. I picked out my two slot.it chappy 2Es and we drove them side by side for over an hour. Then we switched to two of my Pioneer TransAm cars and did the same with them until I happened to check the time and discovered it was almost 1 AM. That was the most fun I've had in a long time.